By the mid-70’s the “new thing” jazz artists were anxious to make records. But no record companies were coming forward. (The medium of the day was the 12″ vinyl Long Player aka Lp record aka album.) There has never been a huge audience for the avant garde and the record companies couldn’t cover their nut so they had no interest. Also, at that time the idea of laterally owning all the rights to your music was gaining some currency. 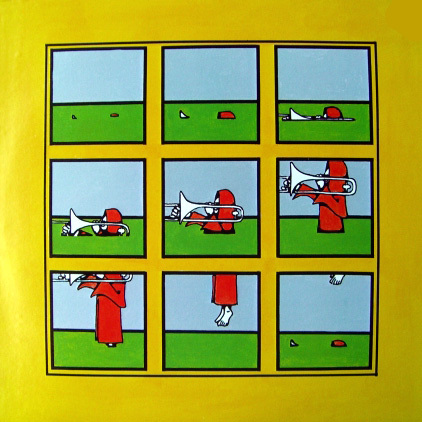 Artists like Leo Smith and Milford Graves/Don Pullen had self-released records. And the ESP catalog was in everybody’s hands in those days, and had that home-made sparse look. Also, an added impetus to spark these Los Angeles releases was the fascinating first batch of LPs that came out on the new Arista label in 1975 by Julius Hemphill, Paul Bley, Frank Lowe, Oliver Lake, Roswell Rudd, Marion Brown, Archie Shepp, Charles Tolliver, and Anthony Braxton. Also, the market was flooded at the time with those Actuel LPs from Paris — tremendously important records in free jazz from Americans living in Paris at the time, and some just passing through: Steve Lacy, Grachan Moncur III, Sun Ra, Sunny Murray, Archie Shepp, Don Cherry, the vastly important trio of Braxton-Leo Smith-Leroy Jenkins, Jimmy Lyons shocker of an album OTHER AFTERNOONS, Clifford Thornton, Sonny Sharrock, Art Ensemble of Chicago, Musica Electronica Viva, Dewey Redman, Frank Wright, Andrew Cyrille, Malachi Favors as sideman on a dozen of them, Paul Bley, Burton Greene, Alan Silva’s giant orchestra, and Jacques Coursil (French cat). These records brought urgency to the Los Angeles scene at the time, we loved these records. It was the Rhino Records store that imported them. There are no jazz magazines on the west coast and jazz musicians living there have had to continue without critical notice, for the most part, and have had to document their music or be completely disregarded. 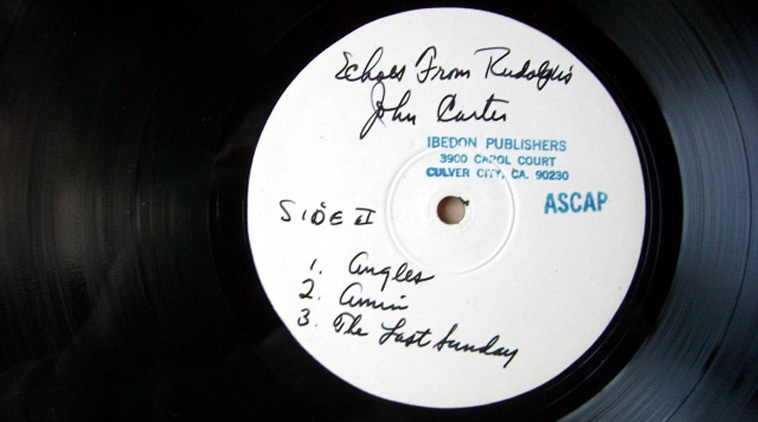 When John picked up his ten copies of the test pressing of ECHOES FROM RUDOLPH’S he gave me one and we sat at his dining room table at 3900 Carol Court while he wrote the titles on the blank label. I still have the test pressing in my collection. When the record came out it has a photo I took of John playing at the Century City Playhouse on the cover. ECHOES came out in an edition of 550 copies. 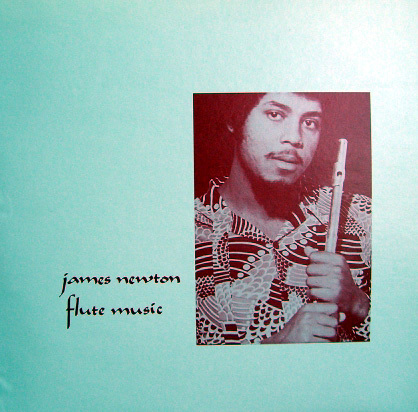 I’m only guessing but I’d say that James Newton’s FLUTE MUSIC also came out in an edition of 500 copies, it’s very rare. A little Los Angeles history: Los Angeles is such a working class 40-hour-work-week Monday through Friday kind of town that Sunday afternoons in the 1960s and 1970s traditionally were for winding the weekend down with a little jazz before hitting the time clock on Monday. Rudolph’s was at 50th & Crenshaw and Rudolph was Rudolph Porter the bassoonist who lived in the back and kept the front rooms of this modest house for recitals and small concerts. Arbor entryway with wine & cheese on a table inside the front door, 25 folding chairs, a sideroom to be used as the green room, a slightly raised stage. 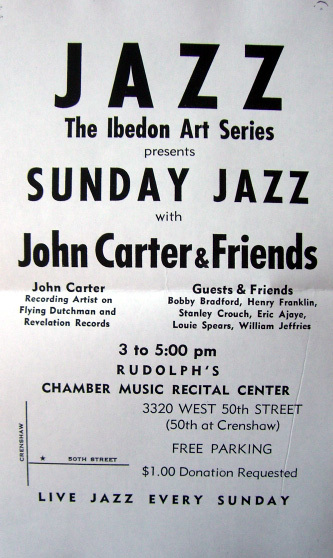 The John Carter Trio reigned there from circa 1974-1976 (exact dates are in my archive at UCLA) with Bobby Bradford not an infrequent guest, and James Newton would pop in occasionally to sit in, and Mark Dresser would drive up from San Diego, or bassist Eric Ajaye would show. Even Burt Lancaster was in the audience one Sunday, wearing his sailor’s cap! Not many white folks showed up at these concerts, it was a little dicey to be there if you were white in those years. 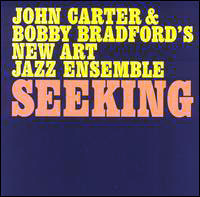 This was a period of John Carter and Bobby Bradford’s musical life that went largely undocumented. John was a multi-woodwinds master, having learned them all at several conservatories in the hopes of joining the Los Angeles studios (but that was not to be, and is another story). I can only speak with exactitude about the years I was on the set, having met Bobby & John in 1974, but by then John was playing exclusively soprano saxophone and clarinet, and we were treated to long coruscating involved soprano solos that dug deep into the well. He treated these afternoons as performances and not workshops for his work, everything was very formal with John, even if there was only 8 people in the house, but that’s not to say he wasn’t beyond making asides to the audience and joking around. He still maintained a professional demeanor. Those of us in his presence learned a lot. The only time I saw him play anything but a soprano or the clarinet was at Vinny’s recording session (18oct77) (overdubs for “Haiku” were added later that month) for his SPIRITS album when John picked up Vinny’s flute and played a few things on it. That was merely between takes, not intended for Vinny’s album. 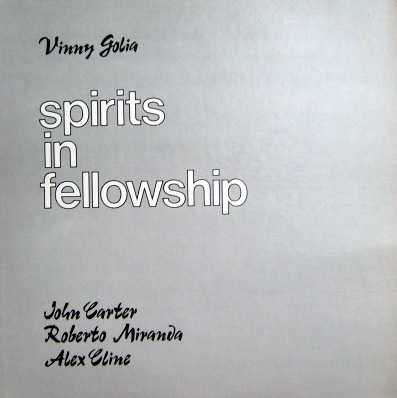 In fact, Vinny had asked John only to play clarinet on this session so that John’s sound would be a stationary element that he could play off of. I posit that John, by the time of Vinny’s session (October 1977) had made up his mind to focus purely on clarinet, even though I have a strong memory of John telling me it took him till he was aged 50 to finally come to terms that he was born to the clarinet, which would put the date at 1979. ANYHOO, it was a great time to be around these artists working on their projects. 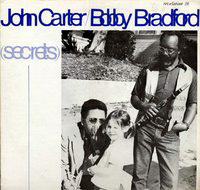 So, only one tune remains of John Carter playing soprano saxophone from those years and that is his “Amin” from ECHOES. I have many audience recordings on cassette made by myself for private purposes where he plays soprano. I wrote for CODA jazz magazine those years and always liked a reference recording to spark my Los Angeles city reports. MORE history: There are six albums of L.A. out jazz that pre-date these self-produced records we’re discussing in this essay. Each one is a magnificent accomplishment. Essential listening. (Sidebar: I’ve had all of these records from when they first came out except Tapscott’s which was impossible to find for years, until, somewhere around 1978 when Vinny worked at Rhino Records he snagged me a copy of GIANT out of the used bins — and then great guy that he is he gave it to me as a gift! ) 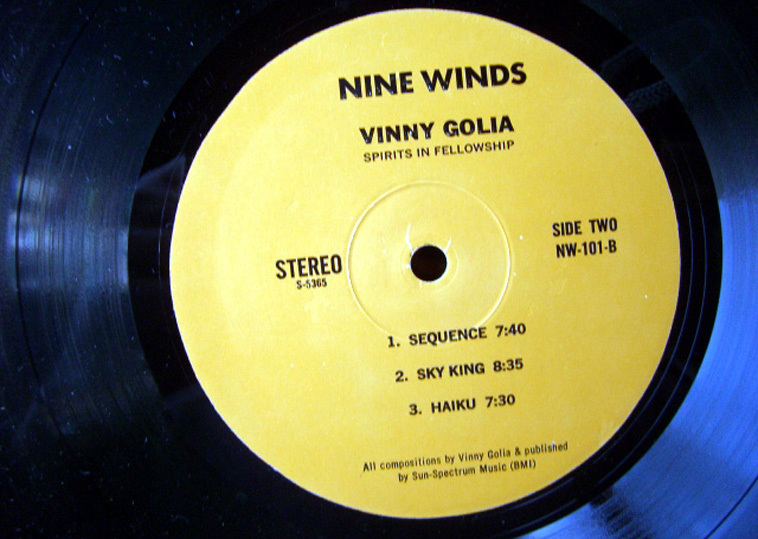 Nine Winds went on to be a major force in documenting the West Coast modern jazz scene and to date has 200 or so recordings in the catalog. But, back in the 1970s it was sparse times. 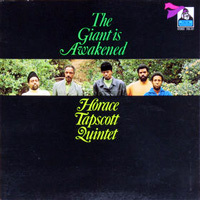 Eventually, Toshiya Taenaka recorded Horace Tapscott in February of 1978 as well at the same time the venerable Tom Albach began his extensive documentation of Tapscott’s music beginning with the release in 1978 of FLIGHT 17 on Nimbus Records (now called Nimbus West). 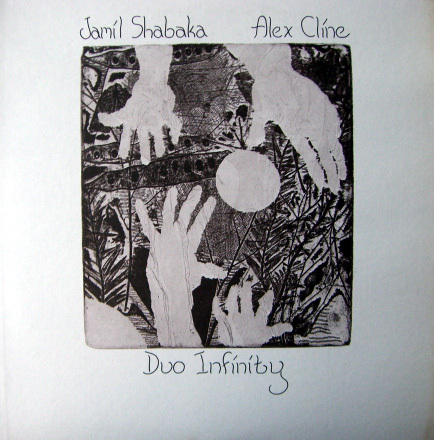 Alex Cline’s first album was self-released at this time, in duet with saxophonist Jamil Shabaka (what ever happen’d to him?) recorded 30may77 and released in 1978 as the Lp DUO INFINITY, which I think is how they billed themselves when they played out. In 1981 Michael Vlatkovich inaugurated his Thank You Records with his first release entitled MICHAEL PIERRE VLATKOVICH, of which post-doctorate degrees will be written some day at the highest conservatories in the land. Mark Weber: Vinny, both your first album and John’s ECHOES were recorded at Spectrum Studios in Venice. I seem to recall that that studio was right on the beach, that right out the front door was the sand and ocean? Vinny Golia: Yes, it was upstairs at the end of Washington (?) I was helping out my friend Arne Frager who owned the studio. I would put some time in and he would give me a deal on the studio time. 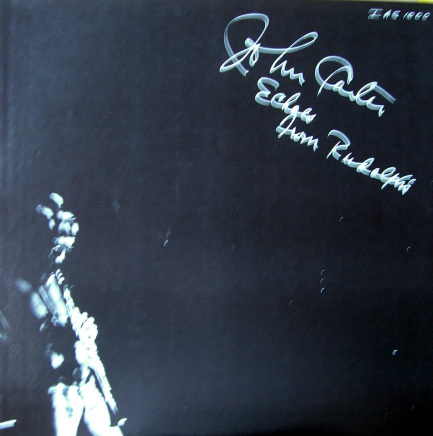 I got some time for John on a bit of a lower price than usual and I liked the sound of the studio. Very easy to play in and not totally dead for horns. MW: Tell us about the two recording sessions with John for ECHOES. Was it fairly straight- forward? Were there many takes of each tune? VG: I only remember 2 takes maybe of the vocals Melba did, also because Chris was playing hand cymbals and he may have gotten carried away as he was just a little kid. Roberto was to be on it but he got stranded somehow in San Diego. But, I only remember one take on most of the tunes. MW: And then John came back several months later and recorded the solo clarinet track “Angles.” Were other tracks recorded that day? VG: I don’t know about that session, but John on that track is totally smoking. MW: How many copies of SPIRITS IN FELLOWSHIP were pressed? VG: First pressing was 1000 and then it was re-pressed once more, you can tell the originals by the orange label, the second pressing was done at Record Technology and had our new logo labels in blue. MW: I was there for the recording session of SPIRITS but have no memory of how many takes you guys did, if any. It seemed straight-forward to me. VG: We did 2 takes on “Easter Morning” as I remember. There was another cut never released called “Palantir” which was good but over 24 minutes. So, we couldn’t use it. MW: Recorded all in one session? VG: That’s right, it and “Palantir” never made it on the album. There is a version of us, John, Alex, Roberto, and myself playing it in San Franciso at the Metropole in 1978 where John’s solo actually stopped time, I saw it, I still do not believe it, but it happened! Mark Weber: Where did the title to the album SELF DETERMINATION MUSIC come from? Bobby Bradford: That was a catch phrase for black people in those days, it had to do with making your own thing happen, to be in control of your own destiny, in spite of everything that was going on. I can’t remember who came up with it. It might have been Bob Thiele [the producer]. I know John and I sat down and talked about the title for FLIGHT FOR FOUR, but I can’t remember who came up with the SELF DETERMINATION title. We didn’t invent it. MW: Oh, all of these years I thought it was another way to describe the manner in which you guys played free improvisation. Like it was the philosophical construct, ha ha ha. BB: Remember how the album cover had that picture of all that sludge? It took me months to figure out what that was about. Just a bunch of stagnant water and goop. Well, it was like the title; don’t stagnate but take control of your own life and make things happen for yourself. MW: Do you think of Sonny Simmons as being part of the L.A. free jazz scene in the 60s? Was his music free jazz? BB: Yes, very much so, but he and Prince Lasha were never residents of Los Angeles, they were both living in Oakland. 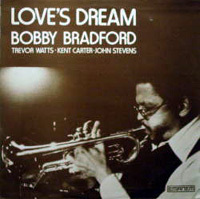 Shortly after the Sunday Afternoon Jazz series ended at Rudolph’s Fine Arts Center in Watts, Bobby Bradford rented a store front at 34 N. Mentor in Pasadena and we converted it into a jazz club & workshop. I helped with the renovation. My brothers and I built a small version of stadium seating out of wood and my wife made curtains for the entryway, somebody installed a refrigerator and we opened for business. The Little Big Horn was in existence 2 or 3 years, the exact dates are recorded in my Los Angeles column I wrote for CODA jazz magazine in those remarkable days. 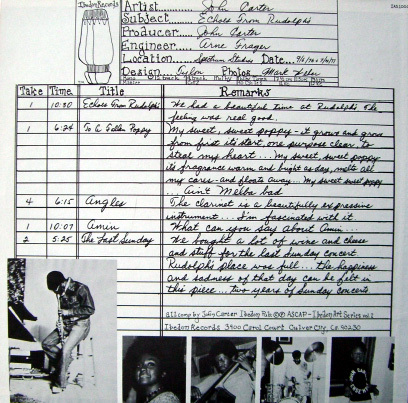 James Newton Trio & Quartet BINU (Circle 21877/11) w/Mark Dresser, Tylon Barea, Allan Iwoharo, recorded by Bruce Bidlack at Studio Z on Slauson, Los Angeles, August 21, 1977.
this was great to read. thanks. Great write-up, Mark. You really did a great job of documenting a critical time period and movement. Both are violinists ! I listen to their music often! courageous turning points in American improvisatory music. What an outstanding & fascinating article. The most absorbing thing I’ve read in ages. Leaves me thirsting for (yet) “MORE History”.. This is great, Mark. How would we know about this but for you? I am especially interested in musician-produced recordings, being a founder of the cooperatively-owned label New Artists Records. It is wonderful to know more about the musicians I value so highly, like Bobby Bradford and Horace Tapscott. Your account is as readable as if I must have been there and lived it. This is great! More info and stories are needed about Los Angeles music. Hi, I just discovered this site knowing a lot of this guys and having almost all of this records (missing only MICHAEL PIERRE VLATKOVICH) i feel like involded l@ least as a big fan of the era. Thanks! It was very nice to read and for shure helpfull for all newcomers. Thanks for making me aware of this blog, Mark. Reading your essay brought back many memories of that era with John Carter, Bobby Bradford, Horace Tapscott, James Newton, et al., and I learned many things I didn’t know previously. I would be a completely different person if I had not been inspired and taught by these wonderful people who were/are also world-class musicians. A thousand thanks for documenting this incredibly important period in music that is too often forgotten. 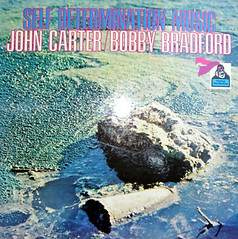 concert ( two sets, ten tunes) of compositions of Bobby Bradford and John Carter. Weaver) on the University of New Mexico campus. There was nothing else on the wall but that framed check! John later re-hung it at the Woodwind College. to enhance our life, and now no life at all. but his profile didn’t move. It didn’t move at all. that patience and energy now wasted beyond recall. lean-tos, bivouacs – – human beings who in spirit are royal. but the music said it – – said it all. Mark…I met John Carter and his wife when I did the Jazz Festival in Colorado I guess it was around 1990 but dont remember the exact year. He made an impact on me not just in terms of his music but in terms of his humanity, his dignity and his quiet strength as a human being. He was one of the few artists whose music and performance at the festival was really not about himself…it was about something else and something deeper that he was in touch with and he gave his music in all humility and it became a gift to all who attended. I was lucky to have met him. I had the vinyl copy of Dance of The Love Ghosts which was lost in a fire. Just a little story. 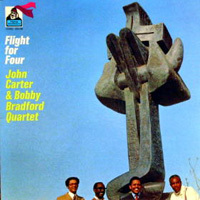 Never met Bobby Bradford but knew about his friendship with John Carter and the Wind College in L.A. Thanks for the very interesting piece of history about this great music. I was inspired to check out some of the records I hadn’t heard of and found that you can still buy original copies of the first Michael Vlatovich from the man himself (via trans value press at http://transvaluepress.com/index.php?main_page=product_free_shipping_info&cPath=3_2&products_id=37) Best $15 I spent so far this year.